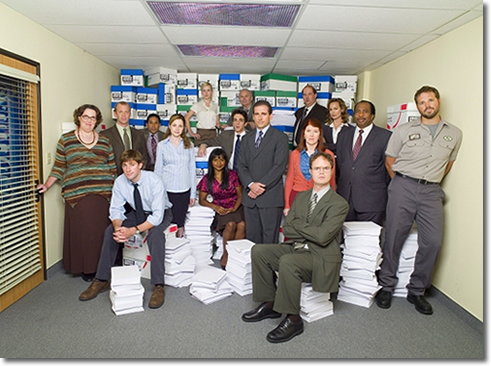 The Office is the best sitcom I have ever seen, in the fact that they have and incredible ensemble of funny and real people and are not reliant upon one person for the punchline. Seinfeld, Barney Miller, News Radio, M.A.S.H. and The Simpsons all have approached near perfection at times, but no one show has identified with regular Americans so routinely as has the collection at Dunder-Mifflin. This is all done in the spirit of respect. This show is incredible and I feel like it was written by people just like me, who have been places just like me. As usual, this forum will work best with you interacting. If you agree or not, please let me know. In order to see the reviews, go to the Home page, look >right> at the “Choose Review Category” header and then right below, you can select reviews by season. Hello, I seen your blog in a new directory of blogs. Your blog looks good. Have a very nice day. I found your blog on yahoo and can bookmark it currently. carry on the good work. That’s a great question. I spent much of the morning searching but I can’t find what episode it’s from. I am pretty sure it was season 5.
if you find it. let me know!